Come and enjoy the sounds of talented musicians, while browsing the stalls or just relaxing under a shady tree. Food, art exhibition and kids rides on offer. For more information, visit the Upper Beaconsfield Village Festival website. Make your own summer music with Peta Minter’s Positive Music Drum Circle, to be held at every Summer Music Series session in February from 12.30pm to 3pm. Centred around friendship, fun and self-expression, Peta brings an array of fun, colourful, vegan and traditional hand drums and small percussion instruments for a fun and exciting group drumming event. All levels welcome, no experience necessary. Babaganoush play a mix of Gypsy, Balkan Beats & Greek folk music. Come and have a social hit at our Club in a beautiful, peaceful, green setting in Emerald. We will provide morning tea afterwards. Have a question? Please phone the club on 03 5968 3057 or email amacdonald50@gmail.com. For more information about Emerald TC, visit the Emerald TC website. 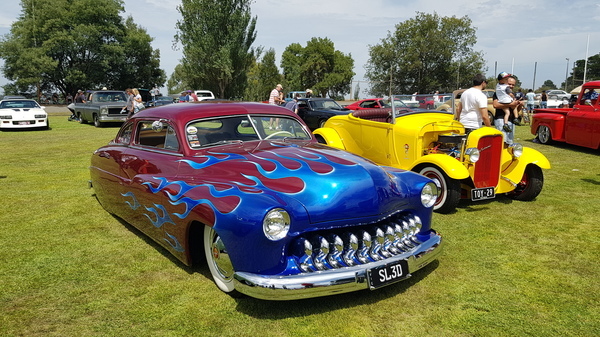 This annual car show displays American hot rods, custom, classic, vintage and veteran cars on the grass at Gembrook Recreation Reserve. Now in its 26th year, the All American Car Display and Man Cave Alley is one of the best all-American car displays on the car show calendar. With increased space for our display cars, we now have room to show up to 900 cars and trucks. We also welcome show-condition late model American vehicles for display. Event also features market stalls selling all the special things that you need for your Man Cave! The All American Car Display and Man Cave Alley is a major fundraiser for the Rotary Club of Emerald & District Inc., held in conjunction with the Thunderbirds Rod & Custom Club Inc. All money raised will go to local and international Rotary projects. Cost: $5 per person, children under 12: free.